Directions: Meet at 7:15 am at the guard shack at the entrance to Maha`ulepu. The volunteers will be escorted to the selected ocean count site by the site leader. This site is located adjacent to Ha`ula Bay. Parking: Parking is available at the end of the road, near the ocean count site. Facilities: No restrooms or water available. Comments: The site is located at the far (Lihu`e-side) end of Maha`ulepu. This is a wildland location. The roadways are unpaved and bumpy. Lawn chairs are suggested for those who do not want to sit on the ground. Permission from Grove Farm has been obtained. Bathymetry: This vantage point is located on a limestone cliff. The bottom drops off to 50 feet within 0.3 miles of the shoreline and to 100 feet within 1 mile of the shoreline. The nearshore bottom is beach rock and consolidated reef with some sediment on the bottom. Offshore the bottom is sand. Directions: This is the high bluff located just past the Hyatt Regency. Drive along Po`ipu Road, beyond the entrance to the Hyatt Regency Kaua`i Resort and Spa. Turn right onto Ainako Street and proceed to the public parking area behind the beach. Walk eastward along the beach to the raised lithified dunes nearby. Climb to the top. Parking: Parking is available at the end of Ainako Street in a paved parking lot that is part of a public beach access. Facilities: Public restrooms and drinking fountains are available at the public parking lot/beach access. Elevation: This vantage point is located on a lithified dune that is approximately 40 feet in elevation. Comments: This site is located in the Maha`ulepu area, adjacent to the Hyatt Regency Kaua`i Resort. This is a wildland location. Physical exertion is required to get to this site. This site is not recommended to anyone with a fear of heights and who is not steady on their feet. Since scrambling to the top of the lithified dune will be required, lawn chairs are not recommended. Permission from Grove Farm has been obtained. Bathymetry: This vantage point is located on a lithifield dune. The bottom drops off to 50 feet within 0.2 miles of the shoreline. The nearshore bottom is a hard bottom type normally basalt with a thin veer of marine life, not reefal or sedimentary. This extends offshore and also may include a hard bottom with sediments that cover up fifty percent of the area. Directions: Site is located on Pe`e Road in Po`ipu. This is the undeveloped oceanfront property next to the Makahu`ena condominium. There is a Coast Guard light on the property. 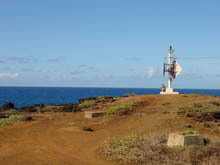 The ocean count site is at the base of the Coast Guard light. Parking: Parking is available along Pe`e Road. Comments: This is the southeastern tip of the island. Lawn chairs are suggested for those who do not want to sit on the ground. Permission from the Coast Guard has been obtained. Bathymetry: Th vantage point is located on a cliffed shoreline. The bottom drops off to 50 feet within 0.7 miles of the shoreline and to 100 feet within 1.0 miles of the shoreline. The nearshore bottom is a hard bottom type. Directions: Po`ipu Beach Park is a county beach park located at the intersection of Ho`owili Road and Ho`one Road. The ocean count site is located near the shoreline, near the start of the breakwater that protects keiki pond, under the ironwood trees. Parking: Parking is available in the public parking lots across the street. Facilities: Public restrooms and drinking fountains are available at the park. Comments: This is a shady site on level lawn that can be easily accessed by those who have difficulty walking or need wheelchairs. Picnic tables may be available nearby, but lawn chairs are suggested. Lifeguards are on duty at Po`ipu Beach. Bathymetry: The bottom drops off to 50 feet within 0.3 miles of the shoreline and to 100 feet within 0.5 miles of the shoreline. The nearshore bottom is a hard bottom with sediment on fifty percent of the area. Offshore, the bottom is sand. Directions: Drive westward on Lawa`i Road, past Spouting Horn in Po`ipu. The trail to the ocean count site is located just east of the Lawa`i Gardens gate. Proceed down the trail to about mid-level with a good view, as determined by the site leader. If ocean conditions are too rough (much salt spray and wave wash), conduct the count from the side of the Lawai Road where the vegetation has been cleared, as determined by the site leader. Parking: Park along the edge of the Lawa`i Road, making sure not to block the turnaround and entrance to Lawa`i Gardens. Facilities: No public restrooms or water available. The nearest facilities are located at Spouting Horn. 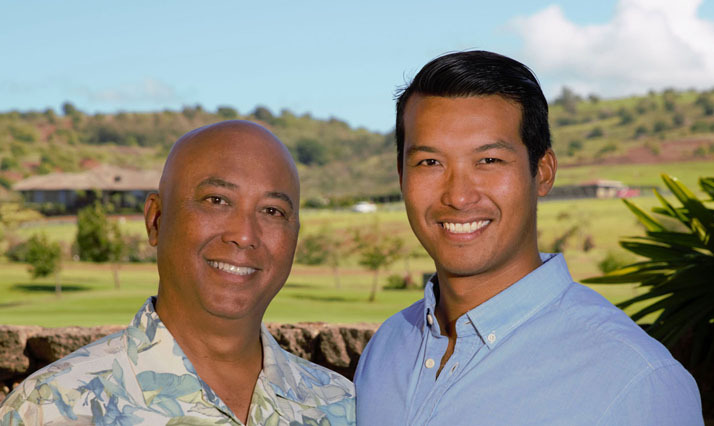 Comments: This site will involve walking a short distance down a sloping, dirt path to a vantage point with sweeping views of the southern shoreline and Lawa`i Bay. Caution should be taken in not getting swept by waves and salt spray. Bathymetry: This vantage point is located on a volcanic coastline. The bottom drops off to 50 feet within 0.2 miles from the shoreline and to 100 feet within 0.4 miles of the shoreline. The nearshore bottom is a hard bottom type. This bottom type extends farther offshore. There is also consolidated reef with some sediment bottom. Directions: Drive to the power plant in the Port Allen industrial area in `Ele`ele and take the dirt road that leads eastward to Glass Beach; continue eastward to the cemetery. Facilities: No restrooms or water available. Nearest facilities are located at Port Allen Small Boat Harbor. Comments: Access to the site is by dirt road. Lawn chairs are suggested. Permission from A&B Properties has been obtained. Volunteers will be required to fill out an A&B right-of-entry permit agreement at the volunteer training session (questions: call sanctuary staff at 246-2860). Bathymetry: The vantage point is located at the top of a cliffed coastline. The shoreline contains basalt tide pools. It is located near an electric plant and discharge area, breakwater, and commercial port. The lands nearby were used as a dumping ground. The bottom drops off to 50 feet within 1.3 nauticle miles of the shoreline and to 100 feet within 1.5 nauticle miles of the shoreline. The nearshore bottom is a hard bottom type. There is coral offshore. Directions: Along Waimea Canyon Drive above the town of Waimea, near the pull-off with interpretive sign. Parking: Parking is available off of Waimea Canyon Drive. Comments: This is not a shorefront location, however it offers a panoramic view of the ocean fronting Waimea. Because of its inland location, strong binoculars are recommended. Lawn chairs are suggested. Volunteers may be required to fill out a Department of Water Supply liability waiver form. Bathymetry: The bottom drops off to 50 feet within 1.7 miles of the shoreline and to 100 feet within 1.8 miles of the shoreline. The shoreline is sand. The nearshore bottom is mostly sand with some rocky features.